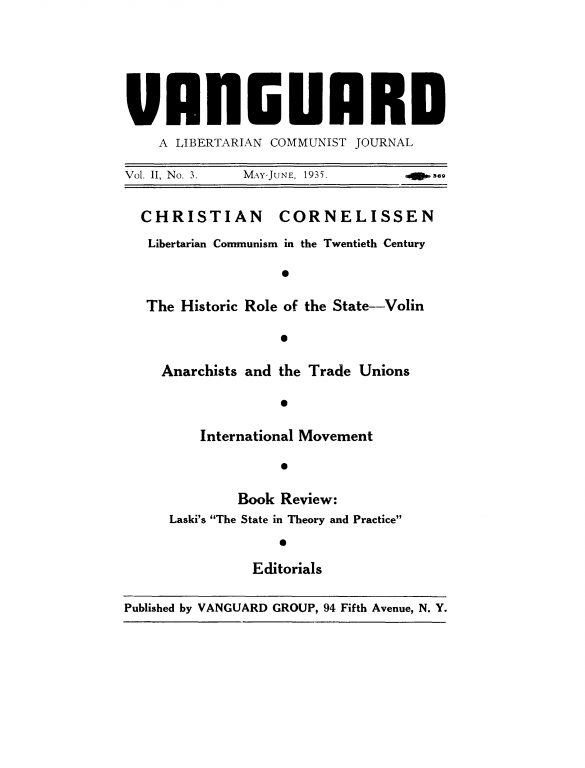 A history by Andrew Cornell of Vanguard, an anarchist journal produced during the 1930s in New York. 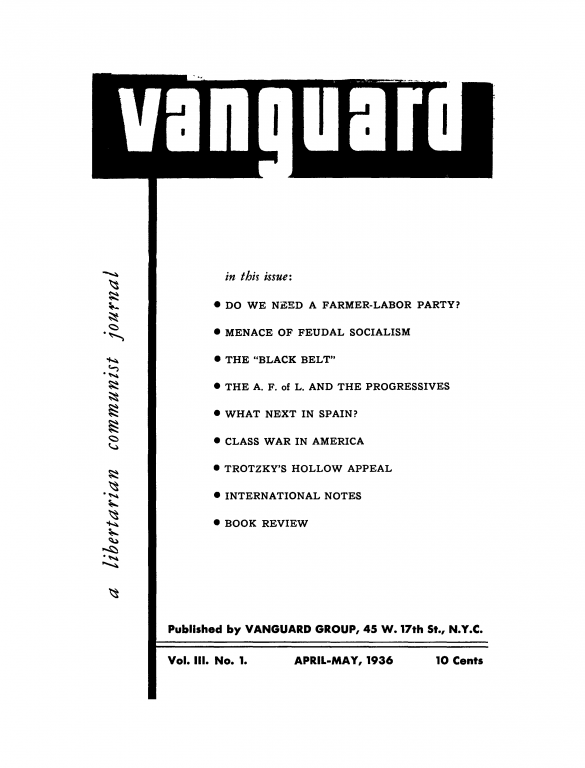 Taken from Cornell's excellent “For a world without oppressors: U.S. Anarchism from the Palmer Raids to the Sixties"
In 1932, the Vanguard Group formed. It would become the leading English-language voice of anarcho-syndicalism in the interwar period. 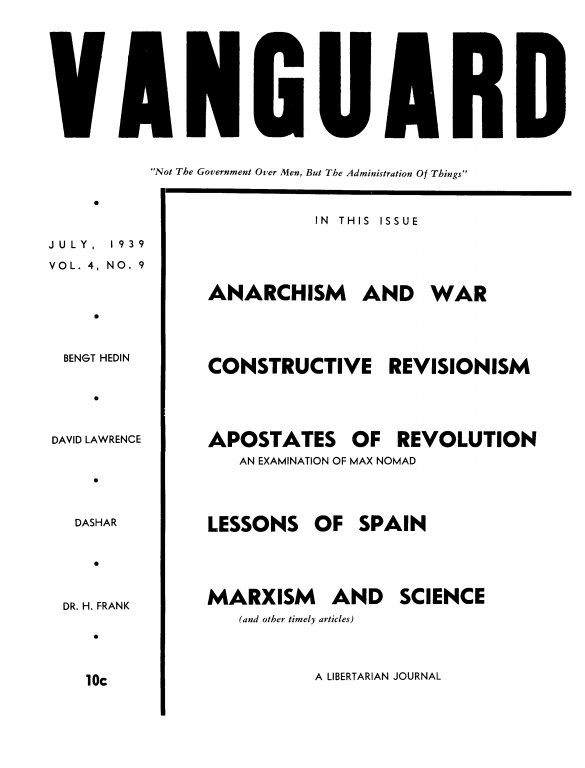 Vanguard began as a circle of a halfdozen anarchists in their twenties and early thirties who met under the auspices of the Road to Freedom Group and through their parents’ involvement in New York’s Jewish anarchist milieu. The political direction of the group was shaped primarily by Abe Bluestein and his friend Sam Dolgoff, working under the tutelage of an older activist, Mark Schmidt. 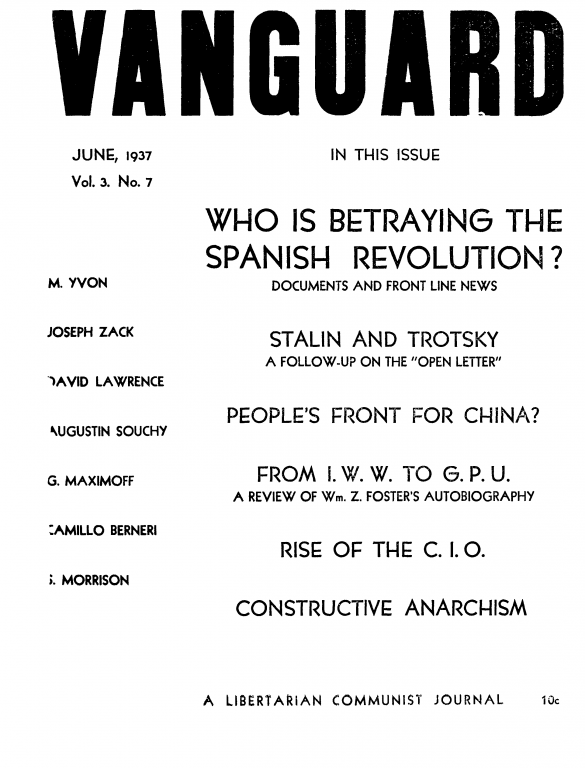 The principle work of the group was the publication of Vanguard: An Anarchist Communist Journal, which it issued monthly when funds allowed. The paper reached a peak circulation of 3,000 to 4,000 subscribers, many of them abroad. Dolgoff recalled that it maintained “a good circulation and a good reputation. We had a very good staff of foreign correspondents.”10 Indeed, the journal carried regular contributions from the likes of Emma Goldman, Alexander Berkman, the German anarcho-syndicalist Rudolf Rocker, and officers of the French and Spanish syndicalist labor federations, among others. 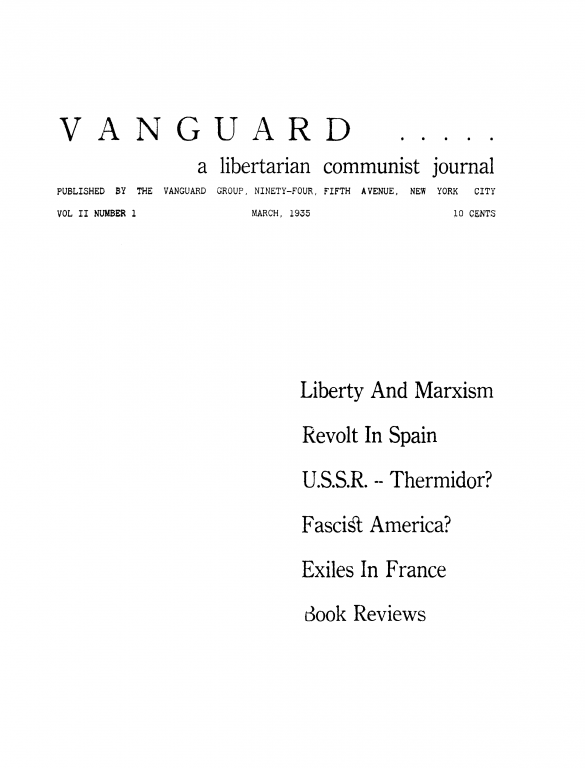 Vanguard was more of a theoretical journal than newspapers like The Road to Freedom or Man! ; while Man! 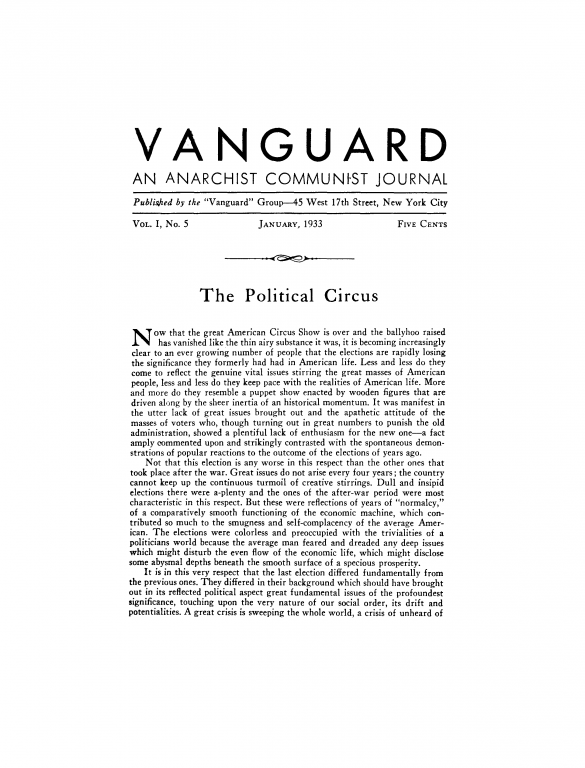 advocated a “planless anarchism” the Vanguard Group launched its publication with a vision of anarchist-communism so detailed it spanned three issues. 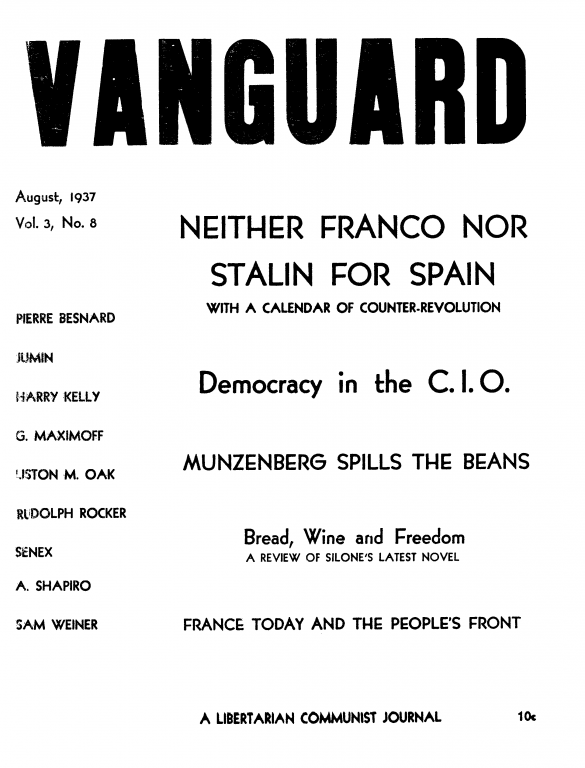 Vanguard believed in organizing working people to struggle for immediate demands in the short term and to organize a general strike or insurrection capable of instituting a self-managed communist society in the future. 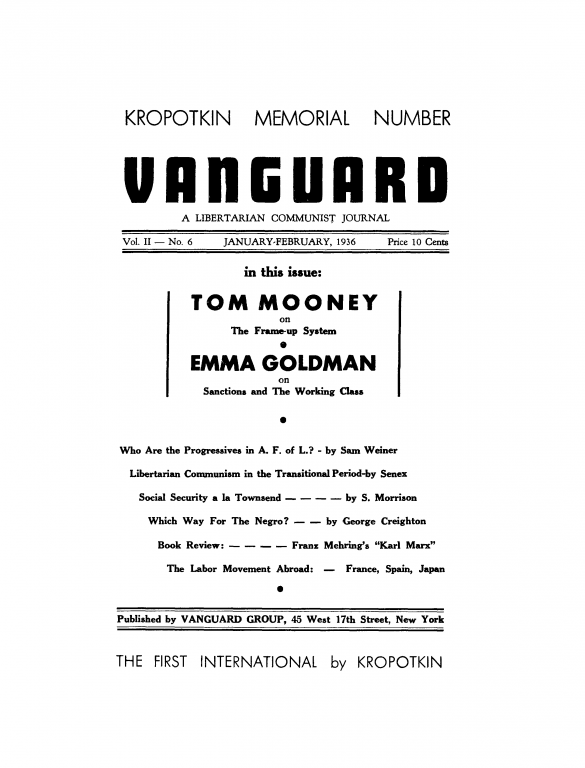 According to Sidney Soloman, “In Vanguard we made no hard and fast distinction between anarchist-communism and anarcho-syndicalism, but we were not anarchist-individualists.”11 Like Kropotkin, the group desired a society that provided for each according to their needs, instead of according to their labor input. However, Vanguard believed, alongside figures like Rudolf Rocker and G.P. Maximoff, that the surest route to such a end goal under contemporary conditions was the via the creation of powerful, revolutionary labor unions. While Man! 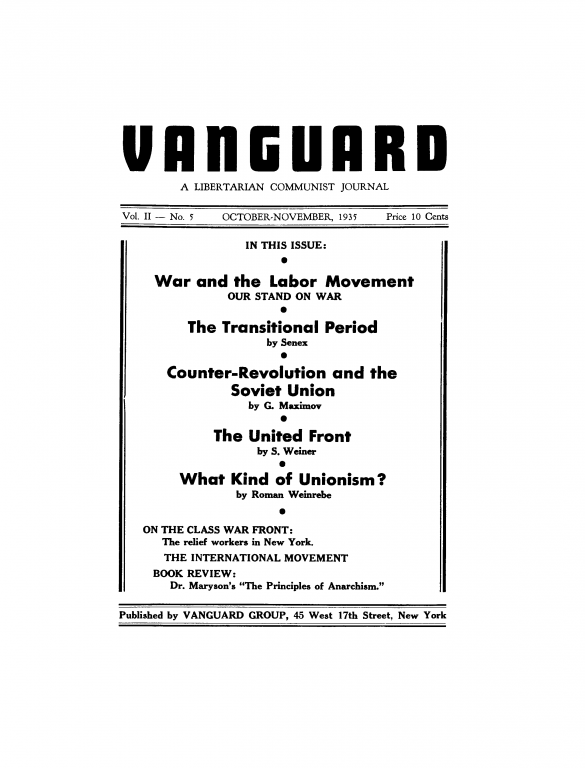 portrayed labor unions as a means of containing working people’s spontaneous rebellions, Vanguard saw radical unions as the primary instruments to initiate a self-managed industrial order. 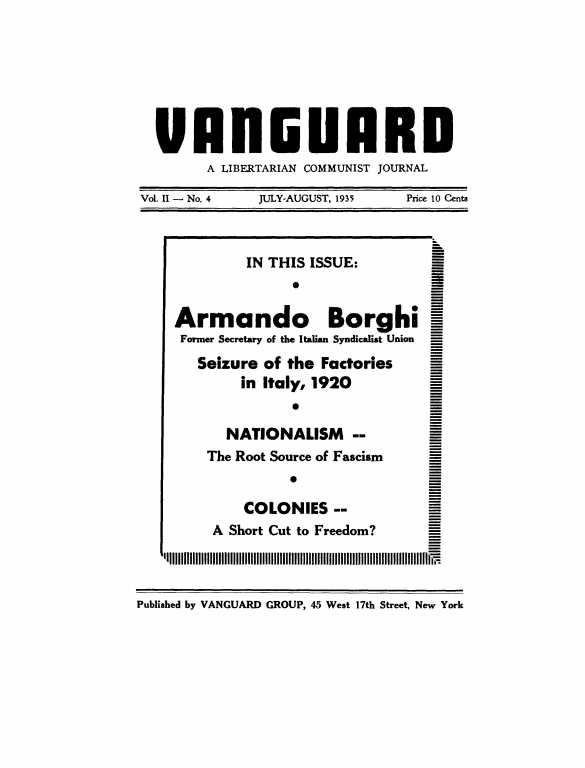 Vanguard distinguished itself clearly, then, from avowedly individualist anarchists who insisted on the right to private property, as well as those that sought to straddle or synthesize individualist and socialist perspectives. While this established a clarity of vision, the editors’ interpretation of what issues smacked of individualism left the contents narrowly focused: anything “bohemian,” such as consideration of modern art, or the promotion of progressive gender roles, was out. 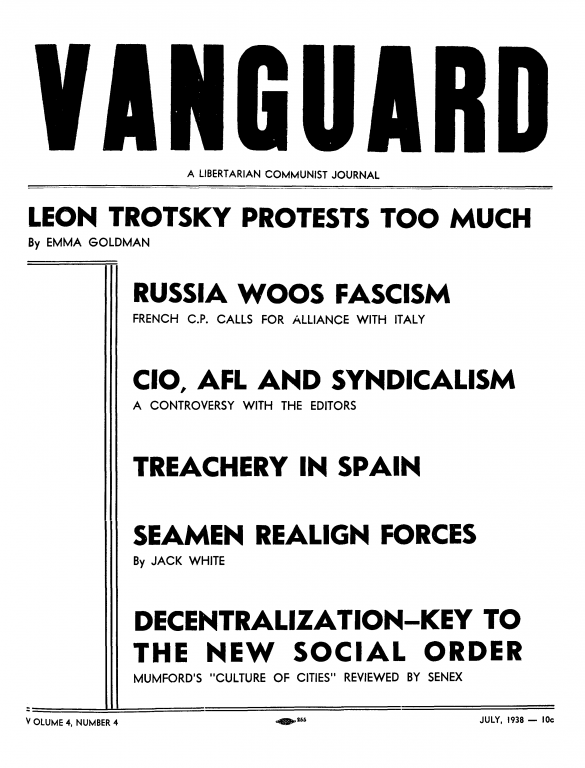 Against such strategic complaisance, Vanguard advocated a hard-nosed anarcho-syndicalist approach and asserted the need for wide scale organizing. 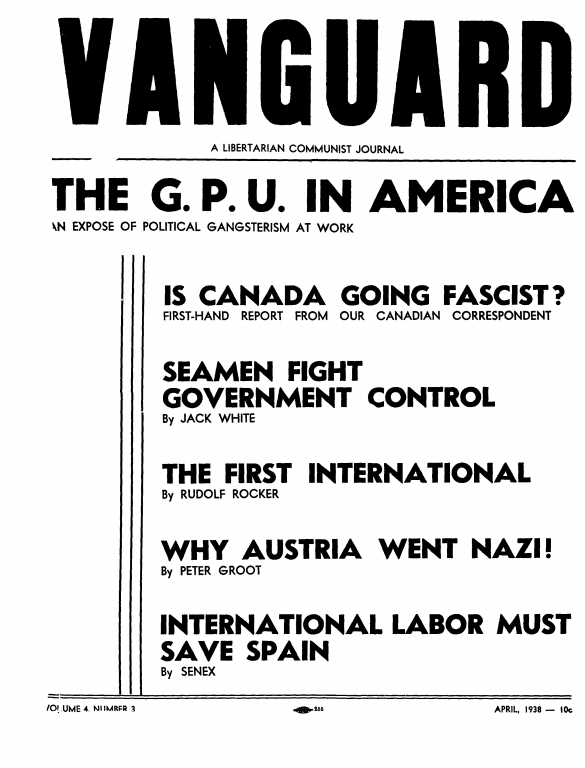 As mostly second generation immigrants, who grew up speaking English and attending public school in the United States, the Vanguard Group presented a budding understanding of the toll the profound shift in the population of the United States, following the restrictive immigration laws of 1924, was taking on the anarchist movement. They declared themselves a “youth group,” not because they restricted membership based on age, but because they believed that their was a strategic necessity for the movement to focus on bringing young people into the fold. For all its intention to develop an anarchism relevant to daily lives of Americans living outside of European immigrant enclaves, however, the group devoted increasing amounts of space to the consideration of events transpiring in Europe. This is not entirely surprising, given the international character of the economic depression and, especially, the spread of fascism and the deepening hold of Stalinism affecting Europe and the Soviet Union. Vanguard covered all these developments from an anti-authoritarian perspective. 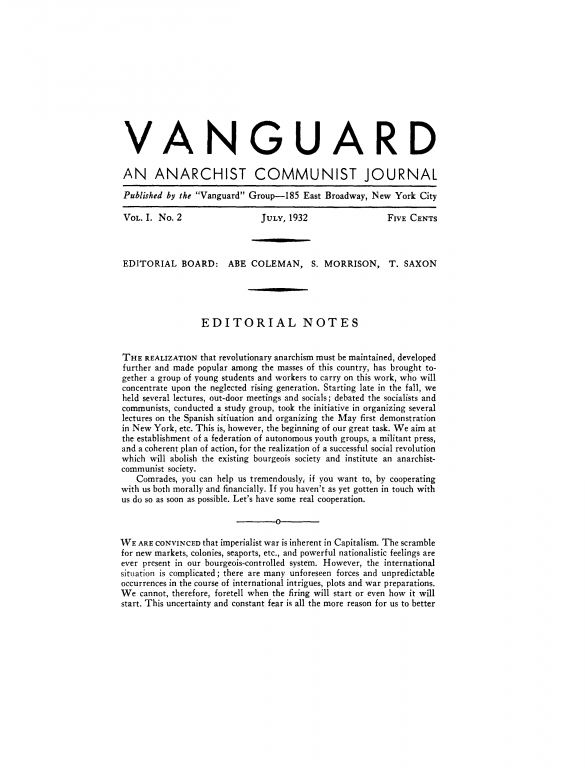 However, the editors also dedicated hundreds of column inches each year to the activities of anarchists syndicalist unions in France, Spain, and elsewhere in Europe, even finding hope at one point in the burgeoning Bulgarian movement. The Vanguard Group maintained a hall in the vicinity of Union Square. It had its own study and discussion circles, debated other New York City-based young left groups, and held entertainment events as fundraisers. Members took short trips throughout the Northeast seeking to recruit new members and presenting lectures on anarchism to college students. 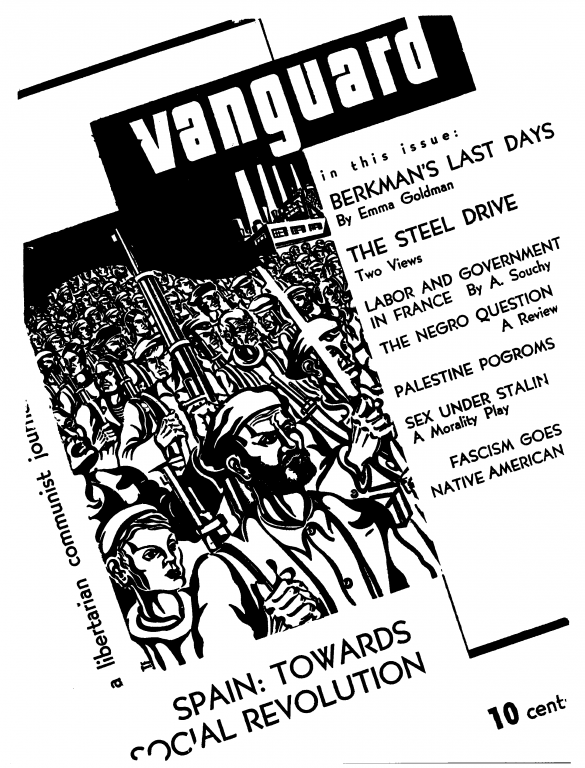 Bluestein recalled, “In addition to our magazine, we conducted forums and lectures and made soapbox speeches on street corners, getting into fights with the Communists all the time, protected by Wobblies with iron pipes wrapped with hankerchiefs.”16 Vanguard sought to develop a network of young anarchist groups around the country as a contribution to a broader resurgence, but was generally unsuccessful in launching groups with much staying power outside of the New York region. Vanguard members, most notably Roman Weinrebe, contributed significant amounts of time to the legal defense of anti-fascist militants engaged in physical confrontations with Italian American fascists.18 This partnership with Tresca ensured that members of Vanguard would be treated with hostility by the Italian anarchists grouped around L’Adunata dei Refretari and Man!. A second circle of Vanguard Juniors developed in the Bronx at about the same time. Audrey Goodfriend, a daughter of Jewish anarchists active in Freie Arbeiter Shtimme circles, launched the Young Eagles with three friends when she was fourteen. Soon Abe Bluestein, who lived in a nearby housing co-op, began a Saturday morning study group with the Young Eagles which eventually attracted other neighborhood high school radicals, such as David Thoreau Wieck. The Young Eagles eventually became incorporated into the Vanguard network. 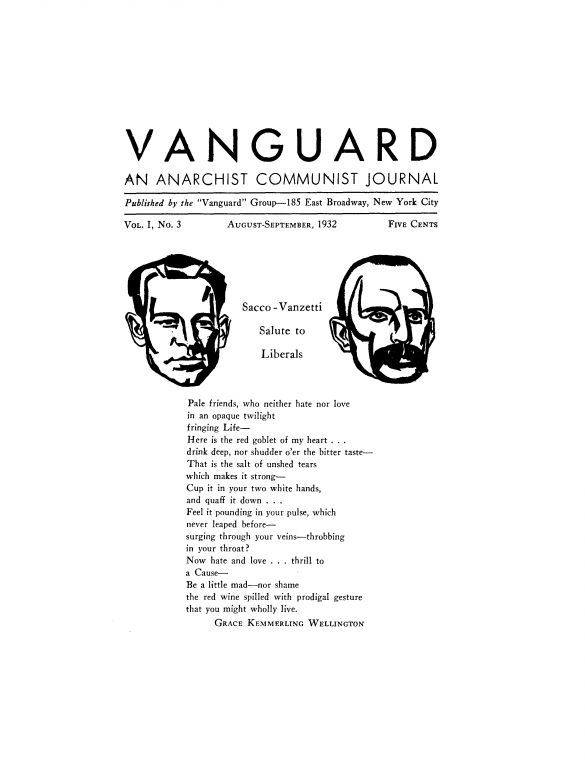 Goodfriend remembers, “We would read [Berkman’s] The ABC of Anarchism; we would read an article from the Vanguard and discuss. And we read some Kropotkin or talked about Kropotkin.”20 Rebel Youth organized fundraisers and social events with the Vanguard Group proper. The February 1933 issue of the journal, for example, advertised a “Dance and Entertainment” in which Rebel Youth was to present two one-act plays and an interpretive dance. Eventually some of the members joined the Vanguard Seniors, while others continued to attend the group’s events and operate on the periphery. The creation of the Vanguard Junior groups were likely Vanguard’s most successful organizing effort. In principle, the the group maintained a commitment to organizing on two fronts simultaneously. It believed, first, in building the power of the labor movement by organizing all working people into radical industrial unions. Secondly it sought to expand the ranks of the anarchist movement itself, so that anarchists might intervene more effectively in all the progressive mass movements of the day. However, the group made certain decisions that stymied that commitment to organizing in practice. In 1933 the new group was handed an opportunity to take part in a campaign to increase the number of New York City garment workers represented by the ILGWU. After the divisive “war” between Communists and socialists in the mid-1920s, the union had begun to fall under the influence of organized crime. In 1933, David Dubinsky, the union’s president, launched an effort reorganize the union “on a new, clean basis” while revitalizing it through a massive membership drive. Recognizing its core of organizers to be insufficient for the task, the union’s leaders requested the assistance of five leftist youth organizations from the city. The Young People’s Socialist League (youth group of the Socialist Party), the League for Industrial Democracy (another social democratic organization), The Young Circle Leauge, the Youth Section of the Communist Opposition (former Communist Party leader Jay Lovestone’s organization), and the Vanguard Group were invited to a joint meeting in February. The youth groups of the Communist Party and the Trotskyist Socialist Workers Party were not invited. Dubinsky and his colleagues appealed to the assembled radical youth to encourage the members of their respective organizations to serve as volunteer organizers in the campaign. At the general conference on February 3rd, all the participating groups, except the Vanguard, pledged their support in the campaign, in strikes, in picketing, etc. Their attitude was apparently one of complete acceptance of the A.F. of L. principles and tactics…The Vanguard Group, however, was of the opinion that an unqualified acceptance of that which is handed down by the A.F. of L. would have resulted in an utter waste of its efforts, and the assistance in the continuation of the same useless and noxious work of organizing limited, ineffective, politically controlled craft unions. The Vanguard members present declared their approval of the idea of the organizing drive in principle. However, they demanded that the ILGWU leadership first create a document committing the union to “full worker’s democracy within the union,” total rejection of using gangsters, “complete dissociation from any political clique,” commitment to organize on industrial rather than craft lines, and a commitment to revolutionary anti-capitalist goals. 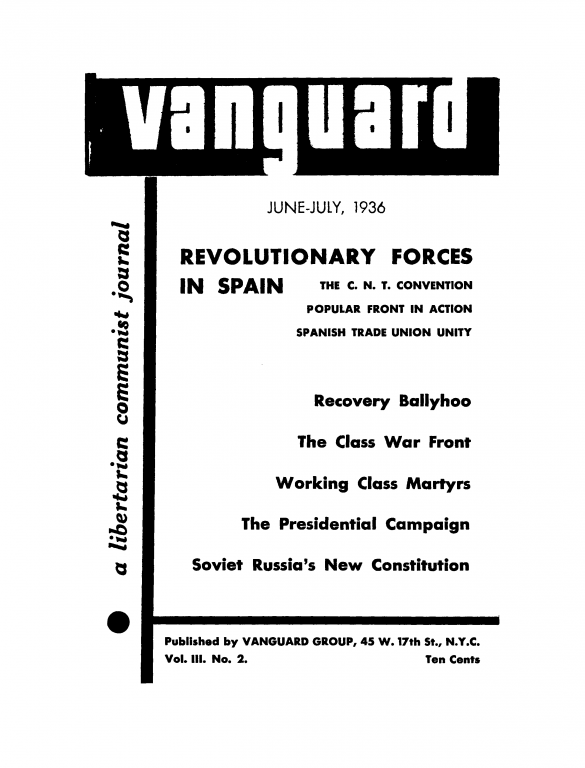 Not surprisingly the union leaders at the table did not immediately adopt the Vanguard Group’s resolution, but agreed to give it “careful consideration.” The report ended with a note of confidence that the issues members raised would be further debated at “subsequent discussion conferences,” and would eventually steer the campaign in a more revolutionary direction.21 Apparently, however, no further conferences were held. 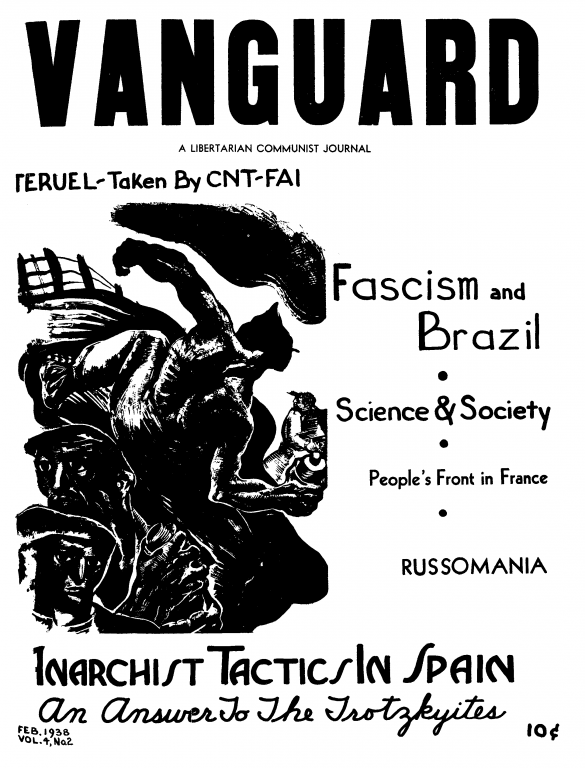 Five years later, during an uptick in support for anarchism occasioned by the Spanish Civil War, the Vanguard Group held a meeting to strategize about expanding its own ranks. The assembled comrades agreed that it was unwise to undertake “practical work” until they had a larger membership and more resources at their disposal. Therefore priority was placed on increasing the combined membership of the groups to at least one hundred members in the coming months. The gathered comrades agreed that “Our efforts must be directed toward, mainly though not exclusively, those elements who are already sufficiently class-conscious. 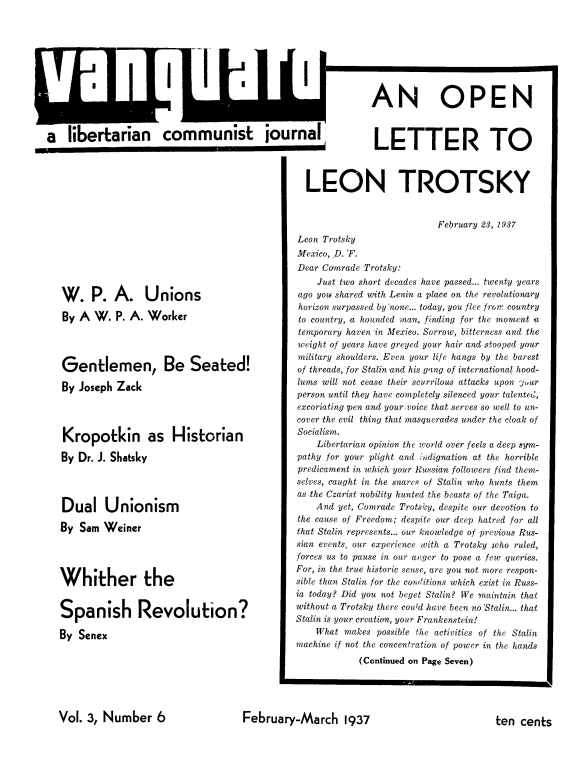 We do not have the facilities at present to undertake mass propaganda or mass educational work among new-comers to the revolutionary arena.” Instead, they decided that efforts should be aimed at “the many sincere and class-conscious revolutionists who are today disillusioned with the Marxist movements and who have libertarian tendencies.”22 The Vanguard Group, then, adopted a strategy of increasing its membership by winning over members and sympathizers of other radical tendencies, by promoting its literature, hosting public events, and organizing study groups. The members believed, to paraphrase Proudhon, membership was the mother, not the daughter, of political engagement. Reflecting back on his experiences in Vanguard forty years later, Sidney Soloman—author of the report on the ILGWU meeting—considered this approach Vanguard took to campaign work to be the group’s biggest error. Soloman believed the group refrained from action largely because Mark Schmidt discouraged it. In retrospect, Vanguard members realized that they had put the horse before the cart in a number of respects. First, they assumed taking action required a perfected theoretical analysis, rather than recognizing that activity and theory were mutually constitutive parts of radical activity that must constantly inform one another in a circular process. Secondly, the young anarchists mistook their goals for preconditions of participation. Rather than viewing the opportunity to participate in the ILGWU organizing drive as an opportunity for anarchists to continue shaping the union in accordance with their vision, they rejected the opportunity as too compromising to their principles. When the Spanish Civil War broke out in 1936, U.S. anarchists were not in a good position to aid their Iberian comrades. Freedom had ceased publication four years before, leaving Man! 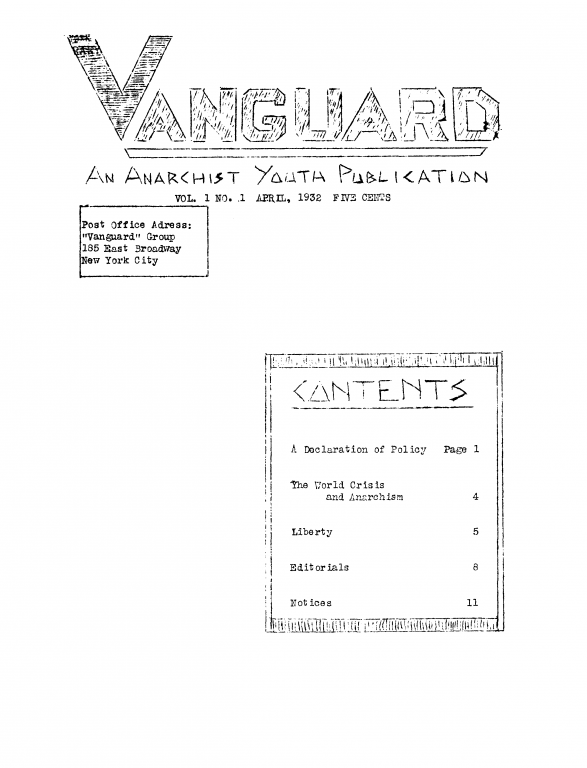 and Vanguard as the only English language anarchist periodicals published on a consistent basis. Newspapers in Yiddish, Spanish, Italian, and Russian still catered to immigrant anarchist circles that were aging and dwindling in size. Still, recognizing that the Spaniards represented the movement’s greatest hope for founding a new society based on anti-authoritarian principles, U.S. anarchists mustered what energy they had to support the resistance to General Francisco Franco and the social revolution unfolding behind the front. The exigencies of the Depression, the conflict in Spain, and the upswing in radical activity during the Popular Front period in the United states created contradictory tendencies for the anarchist movement. During the late 1930s, the morale of the U.S. movement fluctuated in rhythm with the fortunes of the anarchists of Spain. The achievements of the rebels and the depredations of the fascists prompted more interest and sympathy for anarchism than activists had seen in many years. At an August 1938 meeting, the Vanguard Group noted “the present reawakening within our own movement,” and “an influx of new members into our ranks.” Yet by the Spring of the following year it had disintegrated completely. 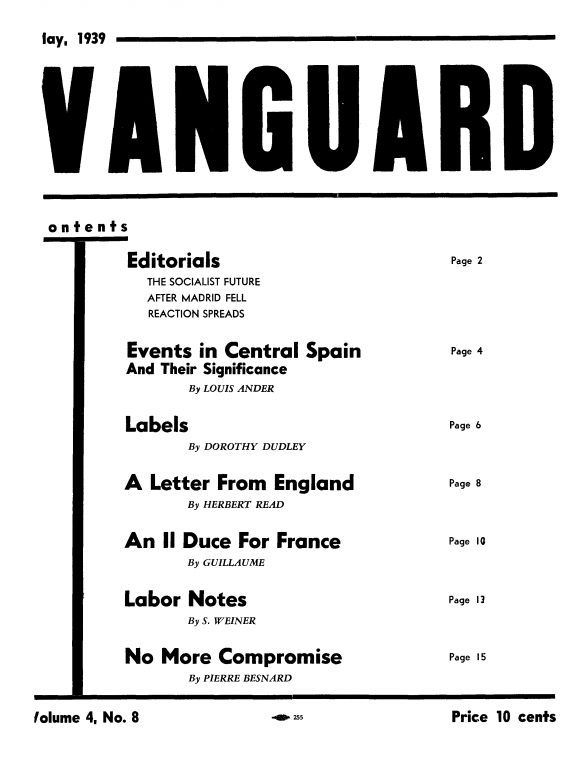 The final issue of Vanguard was distributed in February 1939. Less than two months after the demise of Vanguard, Challenge also folded due to mounting debts with its printer. Always financially tenuous projects, contributions fell to almost nothing following the defeat of the Spanish anarchists. 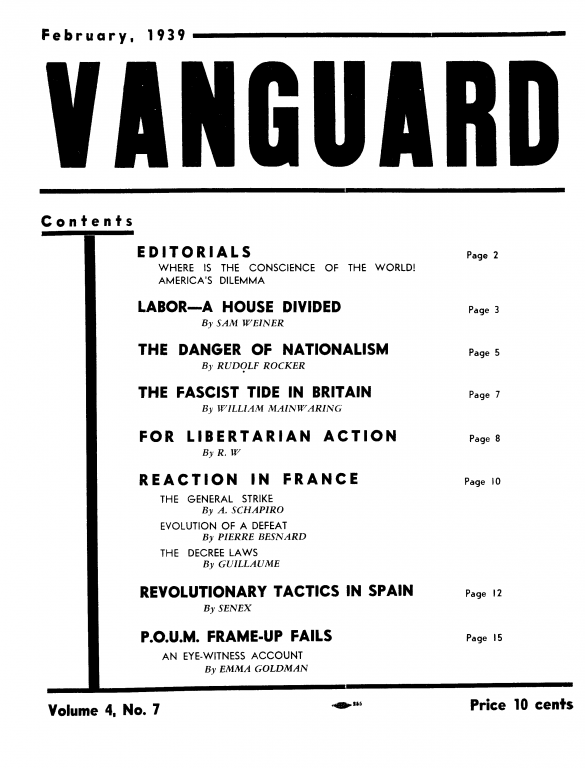 “The fascist victory disastrously undermined not only the morale of the readers but the morale of the members of the Vanguard Group itself,” Dolgoff admitted.31 Despite the knowledge that the anarchist movement was an insignificant force in U.S. social life, members had managed to continue their work through a faith built on hopes for the movement abroad. The defeat of the Spanish anarchists by Franco and his fascist allies, then, dealt a lethal blow. 1. Avrich, Anarchist Voices, 448. 2. Sam and Esther Dolgoff, interview, 1975, compact disc, LC. 3. Quoted in Avrich, Anarchist Voices, 450. Solomon later married Freidman, so his recollections may not be wholly unbiased. Nonetheless his comments indicate that although the group’s men did the preponderance of speaking and writing in the Vanguard Group, the unsung efforts of women were fundamental to keeping the Group’s projects operating smoothly. 5. Avrich, Anarchist Voices, 423-424, 450-451. Cf. George Creighton, “Self Determination for Black Belt,” Vanguard, April-May 1936, 12-14. 6. Bluestein, Oral History, C-5. 8. Avrich, Anarchist Voices, 444. 9. Avrich, Anarchist Voices, 448. 10. Sam and Esther Dolgoff, interview, 1975, compact disc, LC. 11. Avrich, Anarchist Voices, 451. 12. 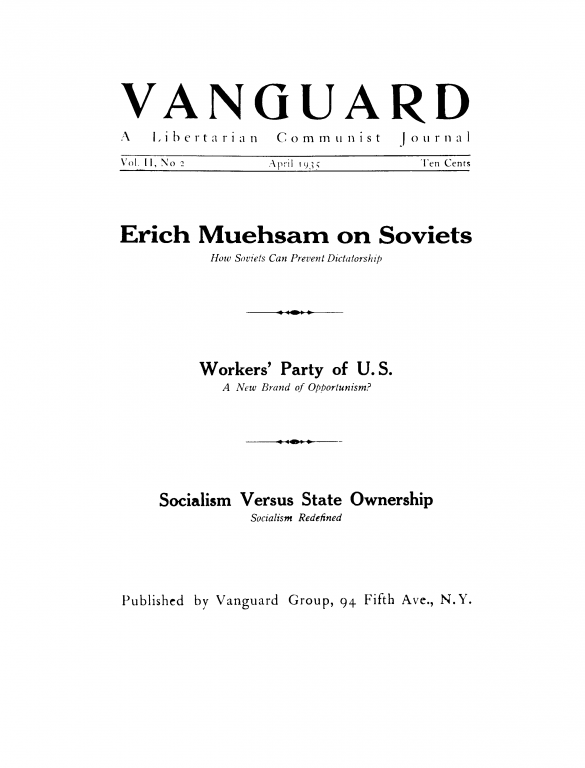 “A Declaration of Policy,” Vanguard, April 1932, 1-4. 13. “A Declaration of Policy,” Vanguard, April 1932, 2-3. 14. “From Our Mailbag,” Vanguard, January-February 1936, 23. 15. “A Declaration of Policy,” Vanguard, April 1932, 3. 16. Avrich, Anarchist Voices, 438. 17. 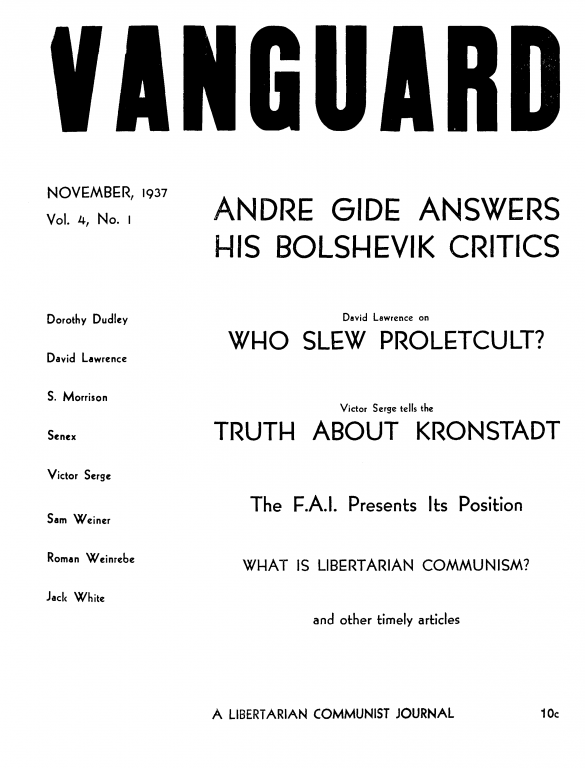 “Why This Magazine?” Vanguard, March 1935, 1; Dolgoff, Fragments, 31. 18. Avrich, Anarchist Voices, 450. 19. Avrich, Anarchist Voices, 457-8. 20. Audrey Goodfriend, interview with author, November 10, 2008. 21. S. Morrison, “The I.L.G.W.U Calls Upon Youth,” Vanguard, February 1933, 8-11. 23. Avrich, Anarchist Voices, 451. 24. Bluestein, Oral History, C-10 to C-38; Avrich, Anarchist Voices, 439. 25. Clara Freedman left Lou Slater for Sidney Solomon. Then, when Slater began dating Elsie Milstein, Slater’s “own mentor,” Mark Schmidt, succeeded in winning Milstein away from him. Avrich, Anarchist Voices, 458. Schmidt launched personal attacks against Slater as part of his campaign to win Milstein’s affections. Sam Dolgoff later explained, “As far as I and the comrades were concerned, she had every right to live with whomever she pleased without interference. But Schmidt had no right whatever to try to drive this sincere comrade out of our movement by labeling him a scab without the slightest evidence to support his false charges.” Dolgoff, Fragments, 24. 26. Avrich, Anarchist Voices, 451. 28. Avrich, Anarchist Voices, 453. 29. Bluestein, Oral History, C-5 to C-7. 30. Bluestein, Oral History, H-8 to H-10, H-19, K-36. 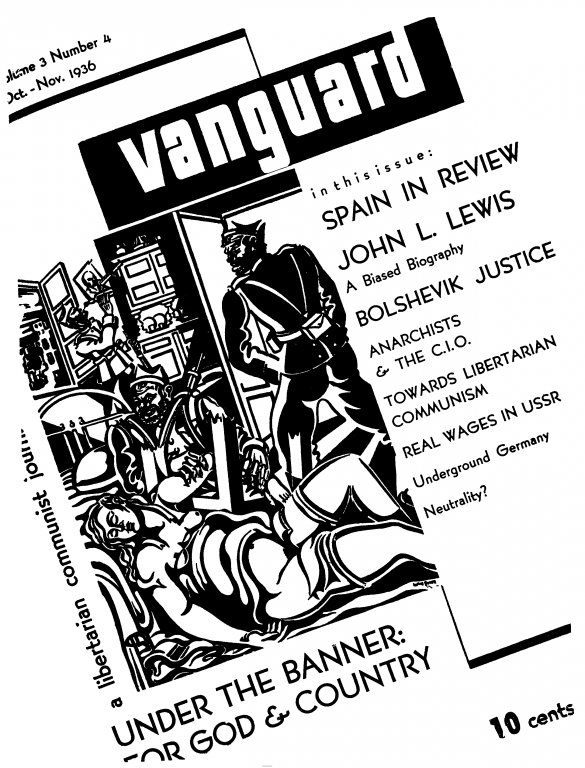 The January 1933 issue of Vanguard, an anarchist journal published out of New York. 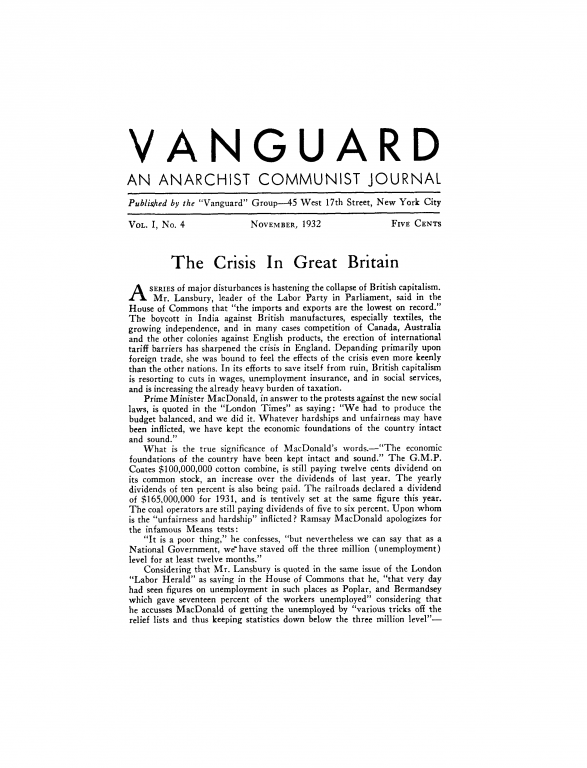 The April 1933 issue of Vanguard, an anarchist journal published out of New York. -The panic and its aftermath by S.X. 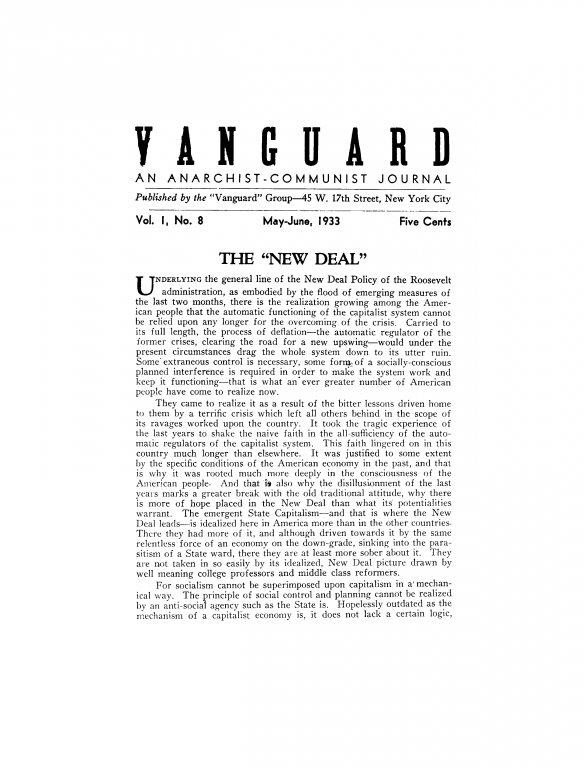 The May-June 1933 issue of Vanguard, an anarchist journal published out of New York. -The "New Deal" by S.X. -A communist reveals his mentality by S.L. -Left winds in Spain by Onofre Dallas (a.k.a. Maximiliano Olay). 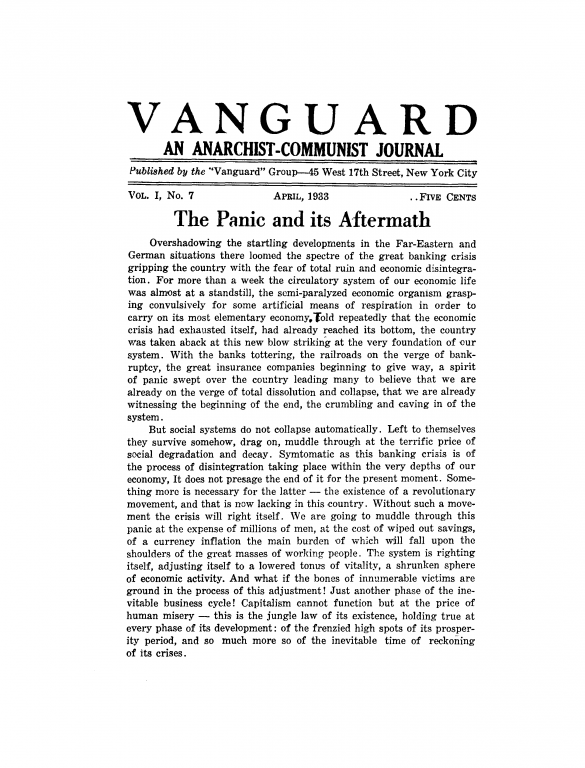 The October-November 1936 issue of Vanguard, an anarchist journal published out of New York, with articles by Sidney Solomon and Emma Goldman. 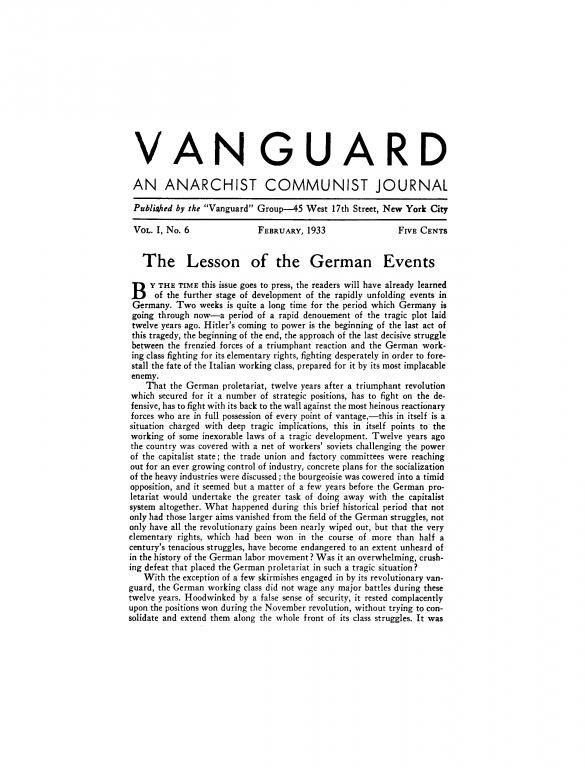 The July 1938 issue of Vanguard, an anarchist journal published out of New York, with articles by Emma Goldman, Senex and Abraham Blecher. Hardly any other idea advanced by the anarchist thinkers was met with as much derision in socialist circles as the idea of free communes, viewed as the nuclei of a new social order federated along political and economic lines. To the great majority of socialists, who fully accepted the political premises of capitalism and who came to regard the latter’s centralizing tendencies in the economic field as the necessary prerequisite of Socialism, this emphasis upon political and economic decentralization was to be interpreted in terms of social psychology rather than social theory. To them it was a romantic escape into an idealized past, rationalized by the ideologists of a class which is being displaced by modem economic tendencies and whose inverted social vision has become strongly colored with nostalgic longings for an historically doomed pattern of life. That there was a solid theoretical foundation to the anarchist ideal of free communes could hardly be gathered from the polemic writings of the Socialist theoreticians, all bent more upon lambasting this idea than taking up its theoretical challenge. How serious this challenge was, is proven by the fact that the sundry elements which went into the building up of this theoretical structure— and taking into consideration the pioneering nature of this work, the structure could not but be loose in many respects, abounding in brilliant generalizations from inadequate factual material—were independently developed by the respective branches of social science along lines laid down by the anarchist thinkers. Thus the theoretical analysis of the role of the association in social life, first undertaken by Proudhon, has been furthered by the pluralists, the most progressive school of political science, whose conclusions in respect to the State lend themselves to the ideal of an ex-territorial commune as envisaged by Bakunin, Kropotkin and Reclus. The historic potentialities of the medieval city as a distinct political structure, first revealed to the modem view by Kropotkin in their progressive implications, have by now become clearly established by a half century of painstaking historical research. A region thus conceived is something altogether different from the political and administrative divisions which disregard functional boundaries. These divisions are the work of the tyrannous political state whose emergence upon the stage of modern history is viewed by Mumford as a colossal tragedy resulting from the disintegration of the superior social and political pattern of the medieval city. Like Kropotkin, Mumford rejects the pseudo-scientific view of the Marxists which attributes to the State the category of a historic necessity brought about by the nascent forms of modern Capitalism. To Mumford, the triumph of the tyrannous political State over the medieval commune was no more of a historic necessity than the victory of Fascism, whose role and dynamics, as it is clear to every student of Kropotkin, are similiar to the one manifested by the emerging absolutist State. It was the logical end-point of a process of enthropy—a “running down” of collective energy, which, unlike the reverse process of a creative upswing, is historically determined in its various phases. Mumford dedicates a considerable portion of the book to the analysis of the general forms of the medieval commune, which to him, as to every libertarian thinker, represents the greatest approach to the natural function of a city as a specialized organ of social transmission. The breakdown of this normal pattern of communal life was the starting point of the process of social disruption, of crystallization of chaos now reaching its highest in the development of a functionally perverted city—the megalopolis—and the threatened collapse of civilization. The development of Capitalism can be understood only in the light of this tragic heritage. The concomitant process of mechanical integration and social disruption, the triumph of untrammeled individualism in economic life, the laissez-faire system of economy—whose idealization, according to our author, is “the democratization of the baroque conception of the despotic Prince,”—all take their origin in the historic twist caused by the breakup of the pattern afforded by the medieval commune. In this sense the development of “Capitalism” was not inevitable. Mechanical progress could take place on the basis of an integrated and not a disrupted pattern of social life. Throughout the development of what is called capitalism, Mumford traces the emergence and development of “mutants”— anticipatory forms of the future social life, needing but the strong focusing of social intelligence to bring out their significance for the social order to come. Professor Smith’s prognostications, made more than a decade ago, were not meant for any other system but private capitalism, which places almost insuperable obstacles in the way of the assertion of those centralizing tendencies in virtue of the monopolistic concentration of wealth and the terrific pull exercised by the megalopolis upon national life. With the removal of the present system, economic life will shape itself in greater obedience to the demands of modem technics which point in the direction of regional decentralization and integration of economic activities on a local scale. Specialization of industry and gigantic units are a liability under conditions demanding flexibility and ease of adaptation. And they will become superfluous with the growing mobility of power, its wider distribution from central energy stations. Along with that go other factors favoring decentralization such as the greater application of systematic knowledge in the exploitation of resources and organization of work; the growing importance of biological and social sciences; soil regeneration, selective breeding, intensification of crop yields through cultivation of plants in specially prepared tanks, and in general, the raising of agriculture to the status of a scientific industry leading to the leveling of agricultural advantages and the fusion of city and rural areas. Those are technical factors operating at the present, but in sketching the outlines of the collective society of the near future one should also take into consideration the incidence of a technic which is just emerging from its experimental stage: the utilization of new sources of power such as solar energy; storage of electric energy; special energy crops grown under conditions laid down by scientific agronomy; the use of television and the fuller exploitation of the airplane. And it is clear that each of these factors will contribute to the acceleration of the same tendency toward decentralization and wide distribution of agricultural, industrial and cultural advantages now centered only in certain areas. Mumford effectively disposes of the stock arguments advanced against the idea of regional decentralization which were held up against Kropotkin by the state socialists of a generation ago. Regionalism, he declares, is not synonymous with autarchy, economic and cultural isolation. Nor does it connote the return to the parochialism and political independence of the medieval cities with their mutual strifes. The region will be the integrated cell but not an independent political unit, a miniature state possessing the attributes of political sovereignity. Inter-regional controls will exist, and for the time being, those controls will be vested in the political state stripped of its power functions and transformed into a “service” state. This is quite in keeping with the realistic trends in libertarian thought which is coming to grapple with the problem of the transitional period in a sober fashion. For political sovereignity can be attenuated but cannot be conjured out of existence by a revolutionary fiat. This realistic approach to the problem of the devolution of political power or “the dying away of the state” is fully accepted by Mumford, whose seminal ideas on this matter posses a great wealth of valuable suggestions which will prove of immeasurably greater importance for the practical solution of the problem then all the talmudistic hair splitting of the Marxists over a few scanty passages devoted by their theoreticians to the same problem of the state in a transitional period. Inter-regional control does not have to coincide with the boundaries of the national state. It will tend to be world wide, just as the foreign trade of the region based upon a special sort of currency directly attached to the commodities exchanged and valid only for this specific function. This, together with free migration, lack of definite boundaries between regions, the extra-territorial linkage effected by the associations within the region and tending to be world-wide with the vanishing of the national state,—all that will gradually create the new world culture, permeated with universal values and shot through with the infinite variety of local motifs and cultural idioms of the regions. This is the ideal of the federalist, libertarian socialism as taught by Proudhon, Bakunin and Kropotkin. And it is toward the reinterpretation of this ideal in the language of modem thought and realities that the latest book by Lewis Mumford— The Culture of Cities a book much too original to be forced into the mold of a single doctrine—makes such a powerful contribution. 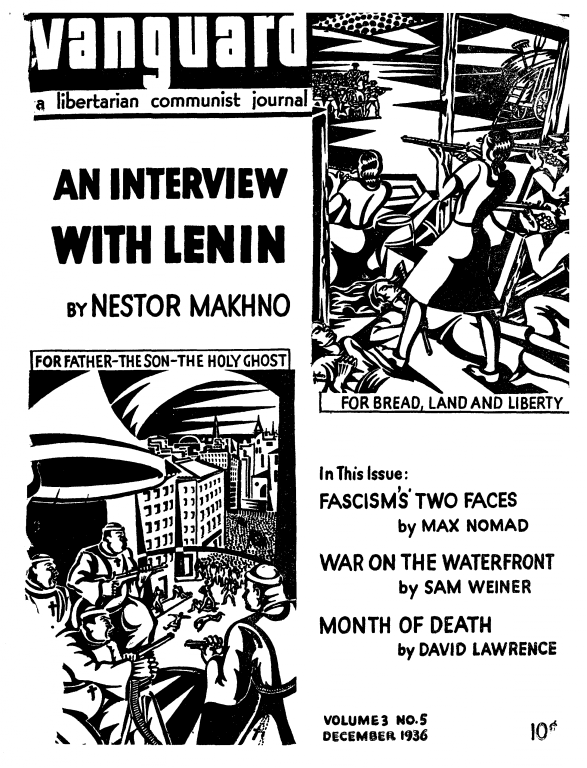 From: Vanguard: A Libertarian Communist Journal. July, 1938. Vol. IV, №4. P. 8-10.